Her beginnings in the trade started in 2010 when she signs up for the Professional Pastry Arts program at The International Culinary Center (formerly The French Culinary Institute). She had previously gone through other sectors such as marketing, advertising, or even music. She worked in Cafe Boulud restaurant and from there went to the kitchen of Thomas Keller in Per-se, where she learned rigor, utmost exigency, and a sense of perfection, specializing in the art of chocolate. After a period of reflection, she decided to open her own chocolate shop in New York, at 202 Mott St, in the Nolita neighborhood (downtown Manhattan). This is how Stick with me Sweets was born. 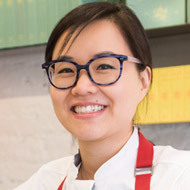 Susanna Yoon treats chocolate with sensitivity and refinement, finishing her bonbons one by one as unique creations and using local products.